Coamo, Puerto Rico. Central Plaza with church . 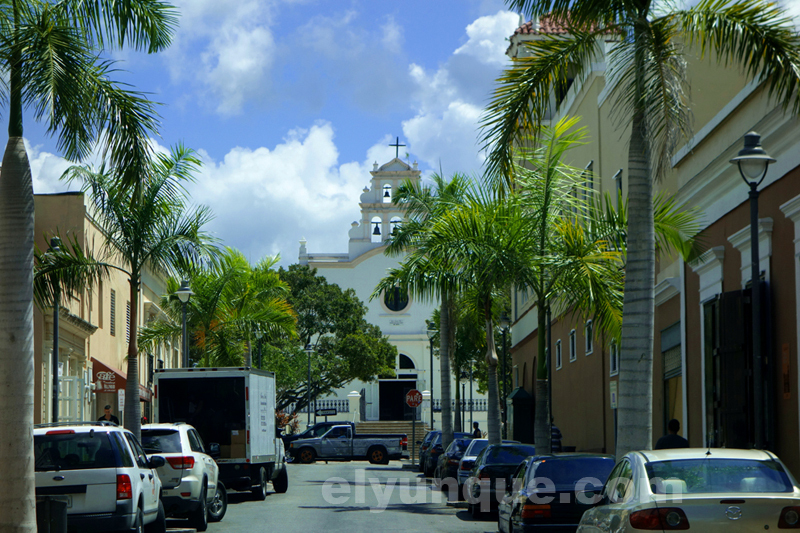 Town of Coamo, main road facing East and the Catholic church on the plaza. Coamo was one of the early towns of Puerto Rico. The nearby hot springs are a welcome dip for anyone, young and old. Rest your weary bones! Very restful, very rejuvenating. It was named San Blas Illescas de Coamo by its first settlers. San Blas was the Catholic saint who remains the town's patron. Illescas is the Spanish town the original founders came from. 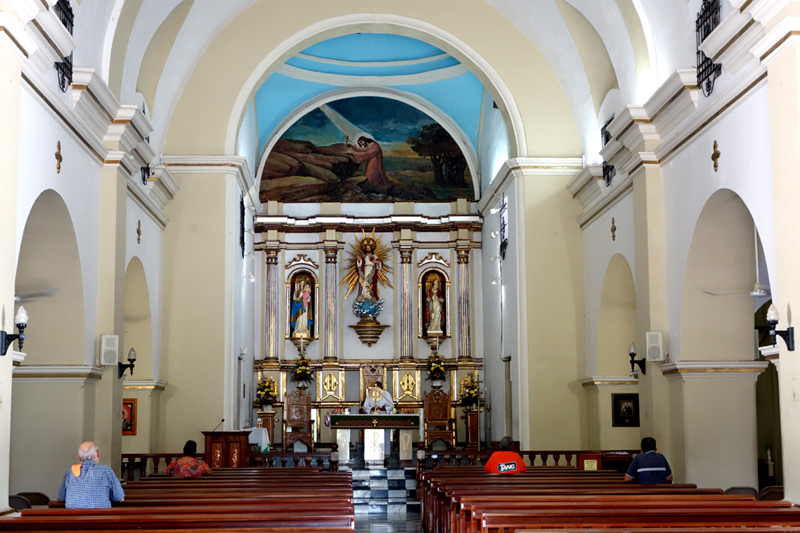 The church contains paintings by José Campeche, Fransisco Oller, and Juan Ríos, in addition to several religions icons. Construction on the church began in 1661; it has since been judged one of the most important works of religious architecture in Puerto Rico. The delicately curved Baroque facade reflects a major reconstruction completed in 1784. A two-level bell gable with open arches and bells is prominently featured in the facade. The parish of San Blas of Coamo is one of the oldest on the island. There is small chapel nearby dedicated to Our Lady of Valvanera who is said to have saved the town from Cholera. Hard to visit, as it is in a school. Coamo has a small Historic Museum. The building was bought in 1976 by the Municipality of Coamo. Many of the fine objects original to the home were aquired by Mr. Florencio Santiago (son of Clotilde) and his wife Sisita Cianchini from their travels to Spain, Italy and the Middle East. The living and dining rooms are furnished and decorated in the Neoclasical Elizabethan style, and the furniture was made from mahogany and cedar by local artisans. The living room has a beautiful lamp, four large paintings representing the four seasons and a sculpture of Mr. Florencio Santiago by the italian artist A. Canessa. The four painting represent the four seasons, and were aquired in Spain at the beguining of the 2oth century. The main bedroom reflects the religious devotion of the Santiago-Cianchini, featuring several religious paintings and icons. The Catholic church in the town of Coamo is open until noon every day. Unusual to find a church open. on the main plaza of Coamo, Puerto Rico. It was listed on the U.S. National Register of Historic Places in 1988.